The RAMONES' trademark LP kicks off with an extremely uncharacteristic barrage of open chord, power strummed, lone guitar. The unsettling absence of '1-2-3-4' is atoned for once the chorus chant kicks in, and it becomes apparent that it's been omitted to prevent unnecessary repetition. The aural adjustment compared to LEAVE HOME is recognizable immediately: the guitars are still layered- but more focused, the bass is drier and less overbearing, and the drums are doctored with fewer effects, leaving them more crisply defined in the mix. 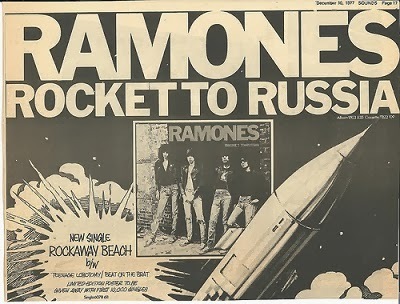 The promise of ROCKET TO RUSSIA's fresh approach was so utterly fulfilled-- and the popularity of this track was so instantaneous-- that it is easy to overlook how much CRETIN HOP might have benefited from the previous album's heavier crunch. One of the most simplistic of all the RAMONES' classics (which IS saying something), the song's melody offers only a three chord verse aside from the opening riff, with an exemplary tribal drummed exaltation for the second part (which again utilizes the repeated intro.) Inspiration for the minimal lyric seems to have sprung from a trip to a St. Paul, Minnesota gig, where the band was amused by road signage referring to the local Cretin-Derham Hall High School, and the adjacent Cretin Avenue. These were all named after a historically prominent area bishop, Joseph Cretin. While CRETIN HOP commences the proceedings admirably, the closing of side one with the perfect climax (WE'RE A HAPPY FAMILY) and the starting of side two with the ideal opener (TEENAGE LOBOTOMY) leaves it almost feeling as if the LP's sides should have been reversed. (Of course, on LEAVE HOME, PINHEAD seemed to terminate the incorrect side as well.) 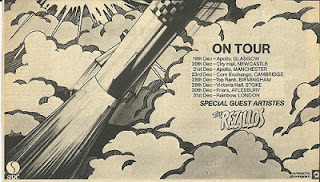 A personal admission: so often in the LP age did I personally swap the sides that now, years later, well after the rise of the CD format, I am still momentarily taken aback when ROCKET TO RUSSIA begins with its actual opener. Amusing, but true. 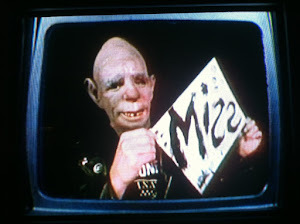 Another rousing call to arms for the RAMONES' disaffected fan base (JOHN HOLMSTROM's accompanying illustration appropriately captures an assortment of amusing misfits), CRETIN HOP was quickly embraced as a key live anthem. The explosive performances of the song on IT'S ALIVE and other concert documents may have eventually overshadowed the studio take somewhat, but with the song permanently added to the set virtually as soon as it was debuted, even the relatively restrained, original version's declaration could not be denied-- For CRETIN HOP, there would be NO stoppin'. Actually Cretin Derham High is not adjacent to Cretin Avenue in St. Paul. They are blocks away.